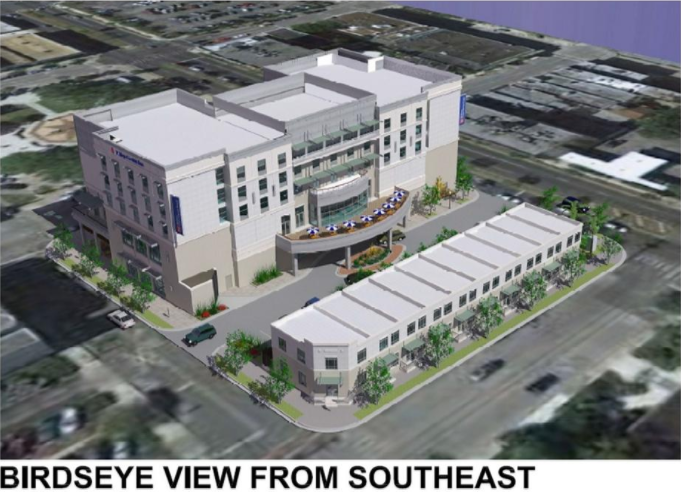 Despite the delays and challenges in building a 90-room hotel on just over an acre of Ocala downtown land, local hotelier Danny Gaekwad said he plans to start construction on the much anticipated structure by mid-fall. Making the job more difficult is the space he has to work with, Gaekwad said. Gaekwad submitted final plans for the hotel this week. The city staff deadline to sign off on the renderings is later this month, said Assistant City Manager Bill Kauffman. The latest proposal includes five stories, but because of the height of some floors, the building will be the height of a six-story building, Kauffman said. The building’s first floor will include a restaurant and other retail space. The city will soon post signs at the site for anyone interested in renting space in the hotel. The second floor will have a main, high-ceilinged lobby and banquet rooms. A second building on the campus will have as many as nine townhomes for rent. Gaekwad’s contract with the city requires him to start building by November and complete the project by July 2019. The estimated budget for the hotel is $15.7 million. There have thus far been two extensions, totaling four months. The first came when the city learned that a small strip of easement at the hotel site was never signed over to the city by its original owners. The city found the owners’ heirs and paid them a few thousand dollars for the land. For the trouble, the city granted Gaekwad an additional two months time. The Ocala City Council granted Gaekwad the second two-month extension last year at his request when some hotel chains were merging and froze any new franchises. The contract with the city requires that the hotel be affiliated with a hotel chain that meets the city’s approval. The hotel will be a Hilton Garden Inn. As part of the hotel deal, Gaekwad will pay the city $54,000 annually to use 120 parking spaces in the city’s new downtown parking garage. Those prices would be reviewed every five years.To make the deal financially feasible, the city also sold Gaekwad the land for the hotel, valued by the Marion County property appraiser at about $802,000, for $100,000. It also will give Gaekwad tax incentives valued at $826,000 over 10 years. The city is guaranteed tax revenues over 30 years totaling at least $2.7 million. Gaekwad said his hotel will be unique in downtown because it will be a new structure rather than a façade change or overhaul of an existing building. He expects the hotel to be completed in 15 to 18 months once construction begins. To speed things along, Gaekwad said, he often uses his own money to start construction and gets bank or investor funding afterward. Kauffman said the hotel design thus far fits well with the city’s efforts to diversify downtown and add a mix of residential units there. “Our goal is to get more people living in the downtown area and renting (townhomes) is a good way to go,” he said.